Studio 7 Designs designed the offices of real estate company Labh Property, located in Gujurat, India. 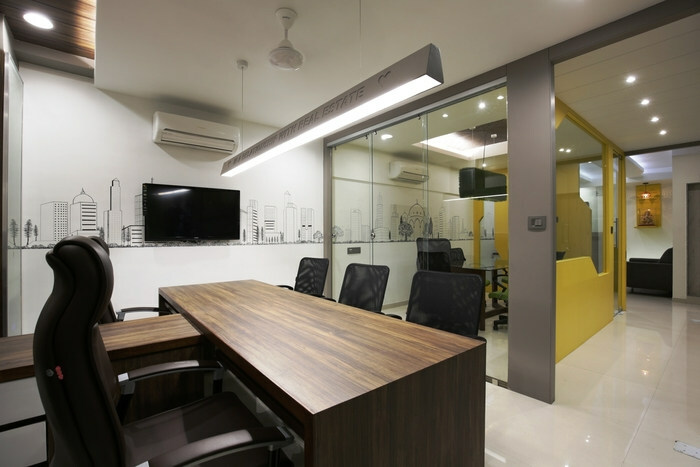 This office is designed for Mr.Rahul Thakker a real estate agent named Labh Property after successful years of business he wanted to move in new premises as existing office is not sufficient to cater client in professional manner. We have divided this office mainly in four parts; mds cabin wich is adjoining to disscussion and accounts another area is staff and reception. Office is with big glass façade in east and south, we have utilised these direction for staff and md cabin, where maximum office work to be done. That way we have achieved to minimise artificial light during day. To avoid glare screened curtain has been used. Yellow color has been used in partion and with white color on ceiling and walls and lime green in one of big column to give dramtic effect, bright colors gives feeling of energy through out day to working staff and bold and positive feel to customer. Art work of city scape on wall has been done which reflects buisness of real estate and gives glimps of citys old heritage buildings. Custom design lamp with lime grass gives feeling of closeness to nature.